I’ve been wanting to start a “Paul Is Dead” section of feelnumb.com for quite a bit now. Here is our first story on clues to Paul McCartney’s supposed death in 1966. Here’s one of the many clues on the cover of The Beatles “Sgt. 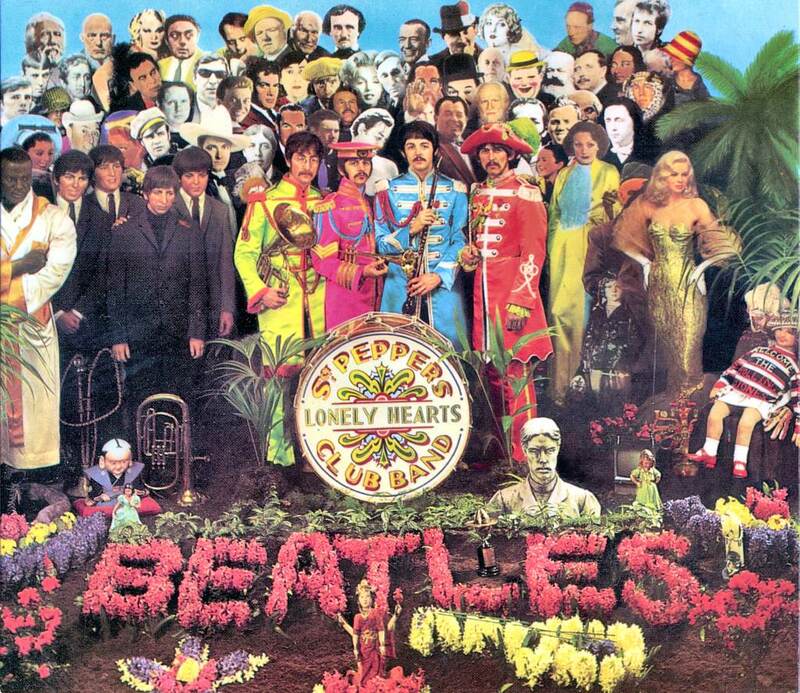 Pepper’s Lonely Hearts Club Band” album. Look at the yellow flowers on the bottom right side under where it says Beatles. The flowers are shaped like a left-handed bass, which is of course, Paul’s instrument. It has branches as strings and if you look close some say it spells out PAUL?. More clues of Paul’s demise to follow in the Paul Is Dead Section. Ha Ha!!! This \”Paul Is Dead\” stuff is entertaining. 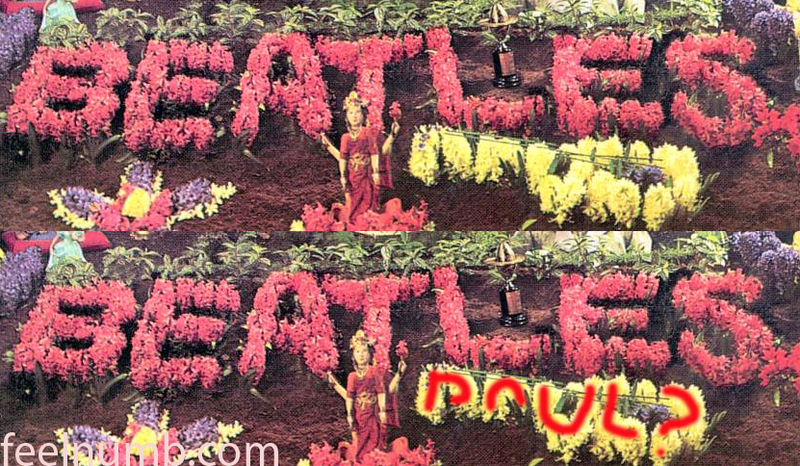 No, the flower-bass doesn’t spell “PAUL?”. BUT, there are, in fact, few evidences there on this picture. Pay attention to the bass, it has only 3 strings, that supposedly means that there are only 3 beatles alive. To the right of the name “beatles” there is an O.
BEATLESO -> BE-AT-LESO. “Leso” is the name of a cemetery in england. Also there are 3 boys in black on the left of the picture. They supposedly represent the younger beatles. One of them is dressed differently ALL in black, and he looks sad, and there is another one with the hand on his shoulder trying to comfort him. That is supposedly to represent they young Paul crying his own death. Also on the cover of “Abbey Road” each one is supposedly to mean a “level” in a funeral. John is all in white – God. I only know John and Paul, the others I don’t know who is George and Who is Ringo but the second on is all in black like a priest, Paul isn’t wearing shoes, in England it’s common to bury ppl with the feet uncovered. And the last one would supposedly be the gravedigger. Also on Abbey Road there is a car on the left and the plate is LMW 28IF that supposedly means: “Linda McCartney Widow” and “28 If (he were alive)”. Although there are all this “evidences” I doubt it. What I think is that this gossip reached their ears and they decided to play with the public imagination to see if we would get the messages. But c’mon, it’s impossible to hide the death of someone like Paul McCartney. Also on the Sgt Pepper cover. The Asian man behind Paul with his hand raised above Paul's head is supposedly am Oriental death sign. Paul's arm patch on his jacket seen on the inside of the album appears to read 'OPD', thought to stand for 'Officially Pronounced Dead'. I have heard this one debunked as explaining it actually stood for 'Ontario Police Department". On the back of the album, Paul has his back to the camera while the others are facing the camera. That was supposed to have been symbolic as well. The 'Young Beatle' dressed in black is actually Ringo. On the cover of Magical Mystery Tour, the Paul was supposed to have been the 'Black Walrus of Death', but it was later revealled that was actually John in that costume. Paul also is out of step with the other 3. He has a cigarette or 'coffin nail' in his hand. The back cover has a big crack running through The Beatles name indicating the impending breakup. There were even people who analyzed Paul's vocals pre-1966 and post-1966 that concluded they were not the same.